The particular eel that is used to make leather is the hagfish, the inshore hagfish. It is a very remarkable fish because they are slimy and covered all over with mucus. They eat carcasses of other dead fish. Okay, we're getting all sorts of reactions. We'll skip it. The prettier side of things. The leather is indeed very beautiful. 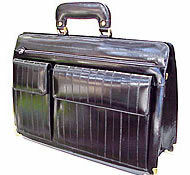 The eel leather is smooth and with elegant horizontal stripe-like patterns. It's just simply good to look at. Very little is known about this particular eel as you can see below. The Inshore hagfish can grow to a maximum length of 116 cm (approx. 46 inches). The Inshore hagfish are not protected. The are found in South Korea, Taiwan, China, and Japan. They are not farmed but are caught in the wild. The glass eel are farmed in the UK for meat. No. They can be an annoying pests to fishermen. They eat the fish caught in the nets while it is being hauled up onto the boat or even when the catch is in the boat. Yes, they are. After all, they are fish. There are no recorded injuries directly involved with the inshore hagfish. On a side note, credit cards and ATM cards are perfectly safe in eel leather wallets. There were concerns about the cards malfunctioning as the eel leather may have come from the moray or electric eel and somehow cause the cards to become damaged. These eels can be slippery and with all slippery things, accidents happen. No, we do not have available statistics. Oh yes, it is. It is a favorite among the Japanese. It is tender and juicy. 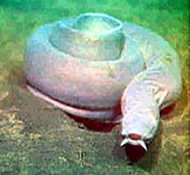 The inshore hagfish usually burrows in the mud of the bottom of the sea. When it is time to spawn it will migrate to a deeper part of the sea. Their spawning habits is seasonal, this behavior being unique compared to other eels. The inshore hagfish eats fishes, dead meat, and marine worms. Example of marine worms are tube worms and milkweed butterfly. Now we do not hear much about marine worms. In short, they are invertebrate animals living in the sea and are at the bottom of the food chain of the sea. They come in various sizes, shapes and color. These marine worms are found in underwater boulders and rocks, sand and mud, the last being the particular ones the inshore hagfish like to eat. Now this particular eel, the inshore hagfish, is not farmed. The glass eel is the one that's farmed and are called eel cultures. These eel cultures can be found parts of the UK and France. They are caught and eaten but we do not have information on its size and weight when caught. A pity. A delicious treat that such information has been neglected? The process begins with the skin removed of all flesh. After it has been fleshed, it is removed of fats and oils. Then it is dyed and cut, pressed, assembled with separate linings and other materials. Then it is ironed (in a special way), polished and applied a waterproof agent. Many believe that eel leather may prevent disaster, and according to Greek mythology it brings good luck & health. It's not to strong, very thin. 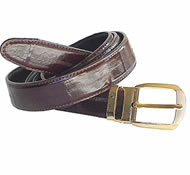 For all normal purposes, eel leather is durable. If it is exposed to the elements frequently, it will needs constant conditioning/moisturizing. It is very soft to the touch and also smooth. The eel leather is more shiny and smooth than most leather types. As it is continually used, it becomes softer and more supple. Many believe that eel leather may prevent disaster, and according to Greek mythology brings good luck & health. If this were true, those who have eel leather wallets and handbags frequently win the lottery. I had better get one soon.